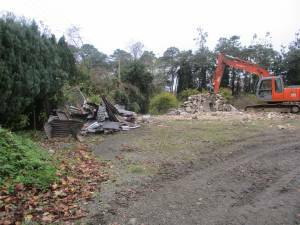 It was the end of an era in Ballinode village on Saturday 20th October 2018 with the demolition of the former Ballinode Creamery to make way for a new community centre on the site. Ballinode Creamery has a long association with dairy farming in the area, and it was powered by a steam engine which is now preserved in McAree’s Vintage Museum. Ballinode Creamery amalgamated with Town of Monaghan Co-Op in July 1976, the last of a number of small branch creameries to merge. Former manager of the creamery Mr Donaldson lived at Lemaculla (where the late Brian McKenna lived). Mr Alexander Montgomery became the manager in 1915, he was originally from Co Tyrone, he passed away in the spring of 1976. He lived in Ballinode village (where Jane Sherry lives), and he later moved to the Georgian Bessmount House on the Armagh Road, outside Monaghan town. Mr Montgomery also managed Ballinode Agricultural Credit society which was a good aid to local suppliers in the 1920s and 1930s. The Ballinode dairy was extended in the 1930’s. It provided a great service to the farming community in the area, and John Hanley and Billy Monahan from Ballinode worked long years in it. 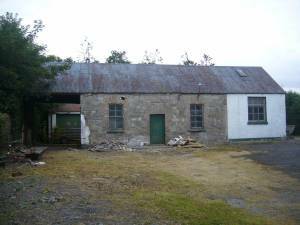 In recent years George McCarron (Clontibret/Knocknagrave) worked at the premises. Ballinode Creamery, an independent auxiliary of Town of Monaghan Co-Op, was founded in 1903, and had 101 members. For 73 years it supplied cream to Town of Monaghan Creamery. Both organisations worked closely together and on 2 occasions Ballinode contributed cash to help the Monaghan town entity erect new buildings – once at the start of the century, and again in 1932. Ballinode was also represented on the Board of Town of Monaghan by 2 delegates. After the manager Mr Montgomery passed away in 1976, the committee entered amalgamation talks with Town of Monaghan Co-Op and the two societies joined up in July 1976. Three delegates were appointed from the area onto the Town of Monaghan Committee to represent the interests of local suppliers. Alexander Montgomery was my partner’s grandfather. Her maiden name was Amanda Montgomery. She has fond memories of her grandparents and of childhood holidays spent with them at Bessmount. Any further information you might be able to provide about the Montgomery family would be very welcome.